Nigel White, Ways into Writing, Leeds University SCE. Our poetry summer school happens in July or August each year at Chop Gate, Bilsdale, North Yorkshire. 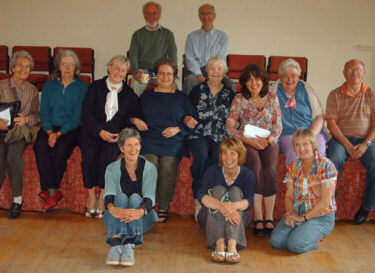 Ten to twenty of us stay at local B&Bs and meet up every morning in the village hall. I come up with a theme and some writing exercises, and we’re off, cracking out first drafts like there’s no tomorrow. But there is a tomorrow, and some of these drafts get made into finished poems. In a year’s time, maybe, you could open the pages of a poetry magazine, anthology, or the poet’s own pamphlet and read one. For example, Carlotta Miller Johnson’s poem ‘Weeding my Sister’ won joint third prize in the Troubadour poetry competition 2009. You can read it (scroll down to the 2009 poems) at Coffee House Poetry. And Jo Heather’s poem Everyday appears in her latest collection Knowing the Dark, published by Indigo Dreams in 2011. Jo wrote it at the 2005 school, themed The World of Things. the arches of your ‘perfect’ feet. Shirley’s poem emerged from the 2003 summer school, themed The Body. Joyce Hodgson, who has recently published a PhD Dynamic Memory: the Long Poem focussing on the poetry of Barry McSweeney, is another regular summer school attendee. End product apart, there’s something wonderful about wallowing in poetry for a whole week. We lose things: sleep, pens, tempers, inhibitions. We gain things: friendship, pens, weight, confidence. We’ve been running the poetry school every year since 2000. Sometimes we invite guest tutors. Ellen Phethean visited us one year, and in 2013, Tamar Yoseloff is coming. If you’re interested, for whatever reason, please get in touch. Perhaps you’d like to join us? You don’t need to be local to be welcome: we’re regularly visited by an American poet. Here’s one of the writing exercises we did recently. You might like to try it. Think of a family significant to you in the past (not your own). Write a couple of lines about each family member, saving the bulk of the poem for the person who was most significant. What did he/she used to do? Say? Wear? Is his/her story related to history in some way?